Animals such as dogs, rabbits, rodents, gorillas, etc. often eat their poop to maintain proper health. 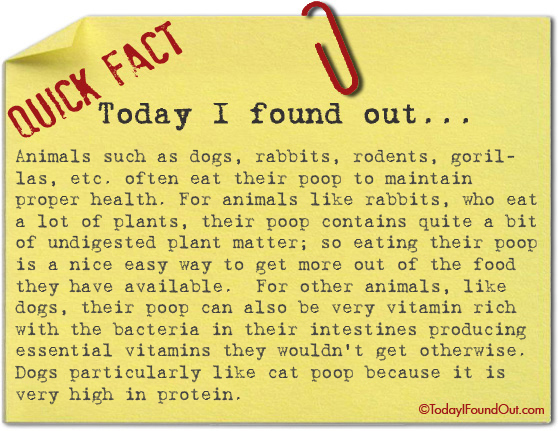 For animals like rabbits, who eat a lot of plants, their poop contains quite a bit of undigested plant matter; so eating their poop is a nice easy way to get more out of the food they have available. For other animals, like dogs, their poop can also be very vitamin rich with the bacteria in their intestines producing essential vitamins they wouldn’t get otherwise. Dogs particularly like cat poop because it is very high in protein. PLEASE DON’T PRINT STUFF LIKE THIS. YOU KNOW SOMEONE IS GOING TO OPEN A NEW TRENDY RESTAURANT WHICH OFFERS, EATING YOUR OWN OR SOMEONE ELSE’S POOP. OTHER SPECIES MUST BE CALLED IN 24 HRS IN ADVANCE. MY GUESS IS THAT CALIFORNIA WILL HAVE THE FIRST.